! I'm so excited to share the process of making this fun and beautiful quilt with you. And finally share my finished quilt photos with you as well! 1. Size of the quilt you’d like to make. 2. Color of your quilt blocks/top. The blocks in the Lighthouse quilt are 8” x 8” finished. My quilt is 5 blocks x 5 blocks, meaning my quilt measure 40” x 40” finished. This is a baby size or wall hanging size. Some of you may want to make this quilt larger. 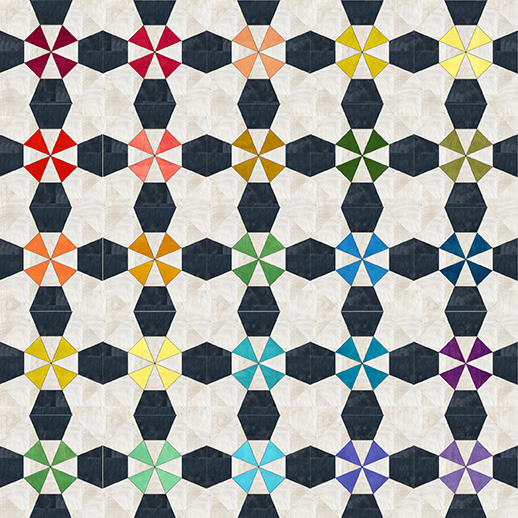 Tip: Keep in mind, each finished block is going to require paper piecing 8 templates. (Easy templates, but still 8 each). So if you are new to quilting, you *may* not want to jump right into a King Sized quilt with 156 blocks, which equates to 1248 paper pieced templates. I'm sure it would be stunning though! Once you decide on what size you'd like to make, it's time to plan your colors. Below I've provided PDF download links to coloring page worksheets. Simply download the size quilt you'd like to make, grab some colored pencils and start designing. And just to get those creative juices flowing....here are some ideas. You could make a complete rainbow gradient quilt just like mine. Or have a common color component that appears consistently throughout the quilt blocks and ties them all together. And maybe that common color is really several shades of a color (in this case, brown). Or maybe you just have a fabric collection that you want to use in a scrappy way as the focal fabrics in the quilt. That's great too! For those interested in making a quilt like mine, I used Marcia Derse's Palette Fabric line. I just found out that the release date was pushed back a little to January 2014. If you happen to want to wait until then, or stumbled across this quilt along at a later date, do not worry. These posts and directions will live on my blog for as long as my blog is around. The following are the exact fabrics I used in my quilt (baby sized) and I did have fabric left over. All fabrics are from Marcia Derse - Palette for Windham Fabrics, January 2014. NOTE: We will talk more in depth about fabric requirements next week. As you can tell based on the amount of information and time put into this post, I feel very strongly that good planning going into a project will lead to a beautiful and successful end quilt. I hope you all will enjoy your week of planning and designing. Next Wednesday we will be making a test block so that we know exactly how much fabric we will need for the paper piecing of the quilt.